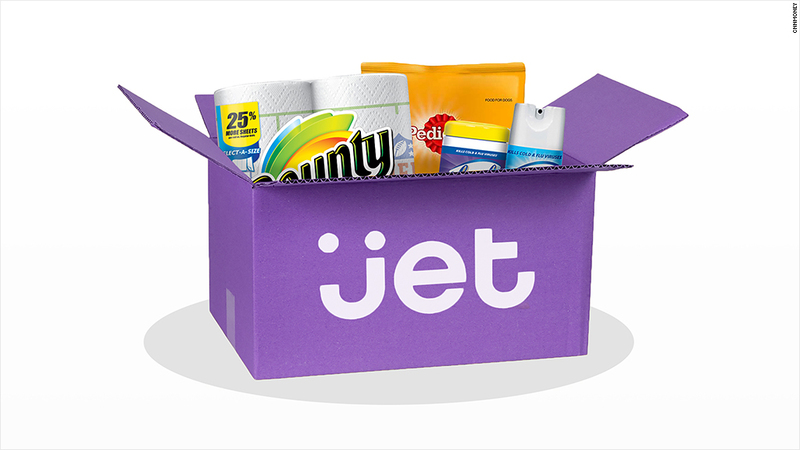 Shopping club Jet.com launches in the U.S.
Walmart (WMT) announced Monday that it has agreed to buy Jet.com, a much-hyped e-commerce site trying to take on Amazon (AMZN) directly, for $3 billion in cash, with another $300 million in stock kicked in for good measure. The deal may help Walmart reinvigorate growth in its online shopping business, which has slowed in recent quarters. Meanwhile, Amazon's overall sales have rocketed above $100 billion annually. "Walmart.com will grow faster, the seamless shopping experience we're pursuing will happen quicker, and we'll enable the Jet brand to be even more successful in a shorter period of time," Doug McMillon, president and CEO of Walmart, said in a statement. Jet.com launched in July 2015 and worked to differentiate itself through bulk buying. Customers are encouraged to add various tagged items to their shopping carts, which can be shipped more cheaply in the same box from a nearby vendor. Those savings are then passed on to the customer. The startup's CEO, Marc Lore, isn't new to building businesses that get snapped up by bigger rivals: he sold Diapers.com to Amazon in 2010 for more than $500 million. Walmart intends to maintain the Jet brand to target younger shoppers, while making use of its proprietary technology to help bundle together shopping items bring down logistics costs. Lore raised hundreds of millions in venture funding in a bold push to take on Amazon directly through aggressive marketing and steep discounts. Lore's bet was that online shopping will be such a large market that even coming in second place to Amazon would prove to be an incredible business opportunity. He also worked to differentiate Jet from Amazon in a more subtle way: by creating a happier workplace culture where all employees received equity in the company. Jet says it has "set out to make shopping more transparent, more efficient, and at the same time, a little more fun," according to its website. It only serves customers in the United States. "We want to be laser-focused," Lore told CNNMoney in 2015. The move is the latest bit of deal-making from Walmart. In June, the retailer said it would buy about 5% of leading Chinese e-commerce company JD.com, an investment worth about $1.5 billion. As part of the deal, Walmart is selling its own Chinese e-commerce site, Yihaodian, to JD. Walmart's CEO telegraphed the need for a change in its ecommerce strategy after the company reported its first quarter earnings, which revealed online sales grew just 7% year-over-year. "Growth here is too slow," CEO Doug McMillon said at the time. --Robert McLean contributed to this report.